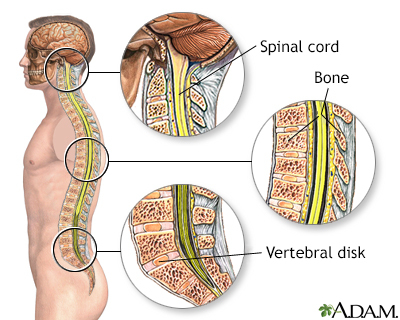 The spinal cord contains the nerves that carry messages between your brain and the rest of the body. The cord passes through your neck and back. A spinal cord injury is very serious because it can cause loss of movement (paralysis) and sensation below the site of the injury. Never move anyone who you think may have a spinal injury, unless it is absolutely necessary. For example, if you need to get the person out of a burning car, or help them to breathe. Keep the person completely still and safe until medical help arrives. DO NOT allow the person to get up and walk. Check the person's breathing and circulation. If needed, do CPR. DO NOT do rescue breathing, do chest compressions only. 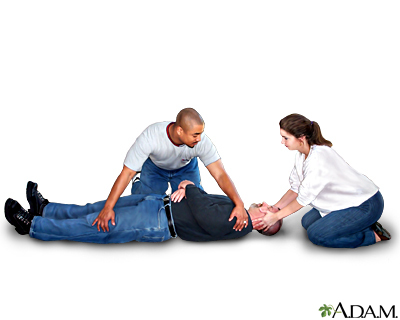 DO NOT roll the person over unless the person is vomiting or choking on blood, or you need to check for breathing. One person should be located at the person's head, the other at the person's side. Keep the person's head, neck, and back in line while you roll them onto one side. American Red Cross. First Aid/CPR/AED Participant's Manual. Dallas, TX: American Red Cross; 2016. Kaji AH, Newton EJ, Hockberger RS. Spinal injuries. In: Marx JA, Hockberger RS, Walls RM, eds. Rosen's Emergency Medicine: Concepts and Clinical Practice. 8th ed. Philadelphia, PA: Elsevier Saunders; 2014:chap 43.